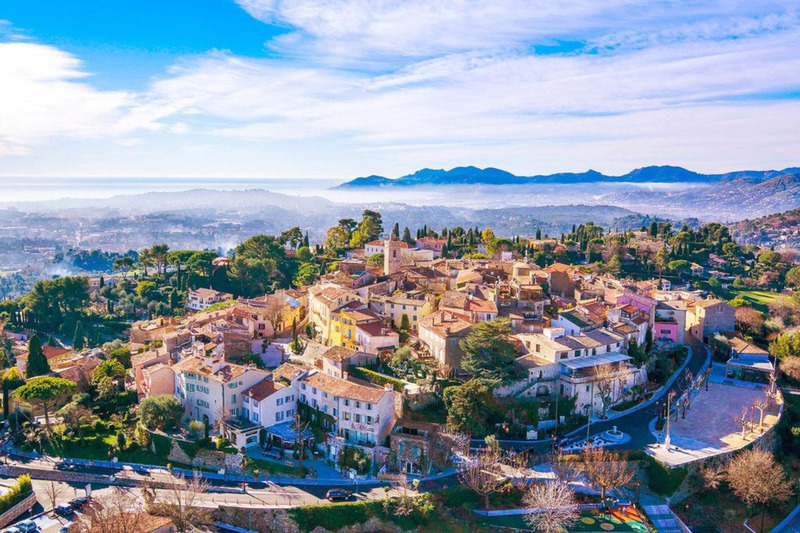 Mougins is a hilltop village situated a few kilometres inland from Cannes in the direction of Grasse, in the Alpes-Maritimes department of Provence, one of many picturesque medieval perched villages that are found all across Provence. The village has a historic centre that is very pleasant to explore with narrow cobbled alleys to stroll along, heading off from the village centre and its central fountain. You will discover various other fountains and statues as you explore Mougins, and numerous other small architectural highlights, both remnants from the past and more modern creations. The village has given a high priority to greenery, and there are many flowers, trees and pretty garden areas, all adding further to the charm and helping Mougins blend into the countryside. Indeed the combination of narrow streets along with the explosion of pots of plants and art galleries spreading into the alleys means you are sometimes positively hemmed in! The views from the village across this surrounding countryside and out across Cannes Bay are as impressive as the village itself. Visit the table d'orientation in the village to help you appreciate how much you can see from here. There are also many art galleries and restaurants and cafes in the town. Perhaps even more than most of the perched villages of Provence, Mougins attracts the rich and famous who live hidden in the surrounding hills, and as a result the town is well known for its very impressive selection of high quality restaurants. In the heart of Mougins you should visit the Museum of Classical Art at 32, Rue Commandeur. This exceptional museum combines sculptures and artefacts from classical times with paintings and other artworks from modern times by artists such as Picasso, Matisse, Rodin and Damien Hirst that were influenced by the classical arts. Entrance 12 euros. Part of the reason why Mougins is so focussed on art is that Picasso spent the last years of his life (from 1961-1973) living just across the valley from Mougins, next to the Chapel Notre-Dame-de-Vie, and many other famous artists (and non-artists) have had homes here. Be sure to visit the Chapel - it's in a very attractive setting surrounded by the 'trademark' cypress trees of Provence. There is also a popular Photography Museum featuring photos of Picasso taken by André Villers (official photographer to Picasso) among others.